Photo: Mercer County Jailers Residence, ca. 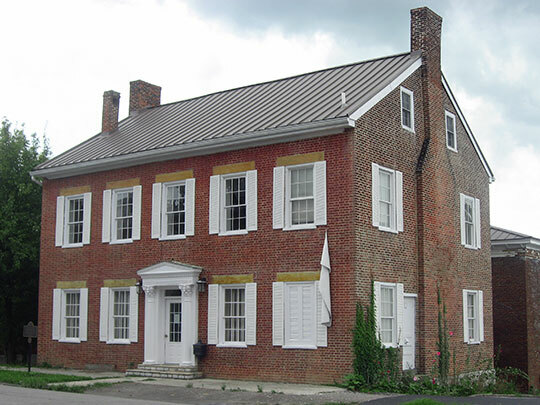 1827, 320 South Chiles Street, Harrodsburg, KY. Listed on the National Register of Historic Places in 1989. Photographed by User:Nyttend (own work), 2010 [cc0-by-1.0 (creativecommons.org/publicdomain/zero/1.0/deed.en], via Wikimedia Commons, accessed June, 2015. Mercer County administrative offices are located at 208 South Main Street, Harrodsburg, KY 40330; phone: 859-734-6066. Mercer County was created from part of Lincoln County in 1785. It was named for General Hugh Mercer who was killed in the Revolutionary War, Battle of Princeton (1777).